Growing up to 60cm tall, a hedge of lavender Hidcote (a traditional English lavender) can be used in many ways. Supplied as 12 jumbo plugs (2.5 - 3.5cm diameter), ready to plant out. Seen in some of the swankiest gardens across the country, lavender hedges are easy to create features that will delight all the senses for many years. The silvery grey foliage and pure purple blooms are packed with a heady scent and will provide you a colourful spectacle from early to mid summer. Hidcote is one of the most aromatic varieites, grown widely in the fragrance market, yet is a great garden variety too. The purple flowers are also a magnet to bees, butterflies and other beneficial creatures, which will have your garden buzzing with wildlife - literally! Growing up to 80cm tall, a hedge of traditional English lavender can be used in many ways. Try planting it around beds, borders or paths, to divide up parts of your garden or to make an eye-catching parterre or knot garden space plants 30cm apart. 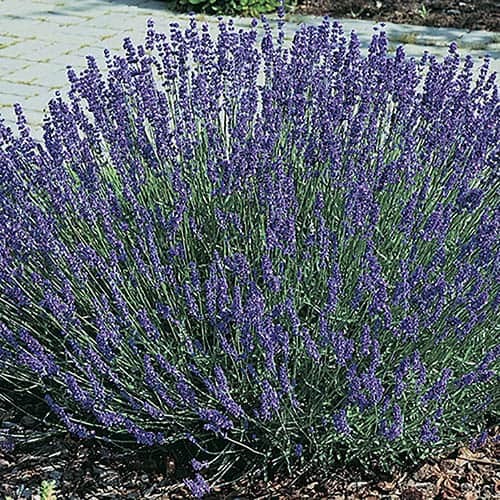 Once established, a lavender hedge is extremely drought tolerant. Keep it in great shape by pruning twice a year; trim lightly in mid to late summer, removing spent flower heads. Prune again in early spring, removing about 2.5cm of growth.